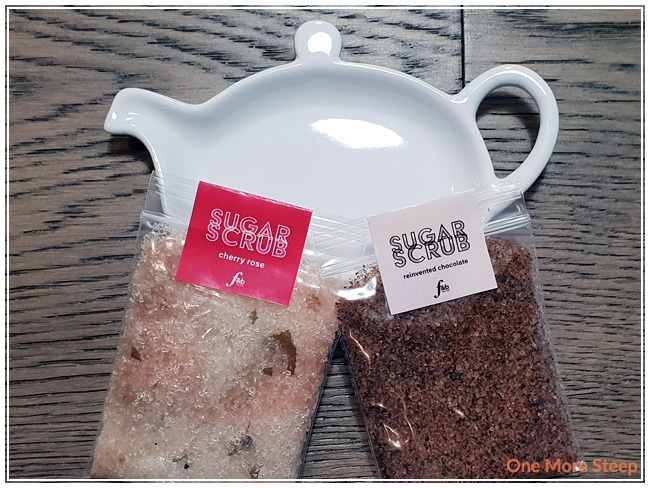 F&B Tea Co’s Sugar Scrubs came to me as part of The Sugared Teacup’s August themed subscription box. 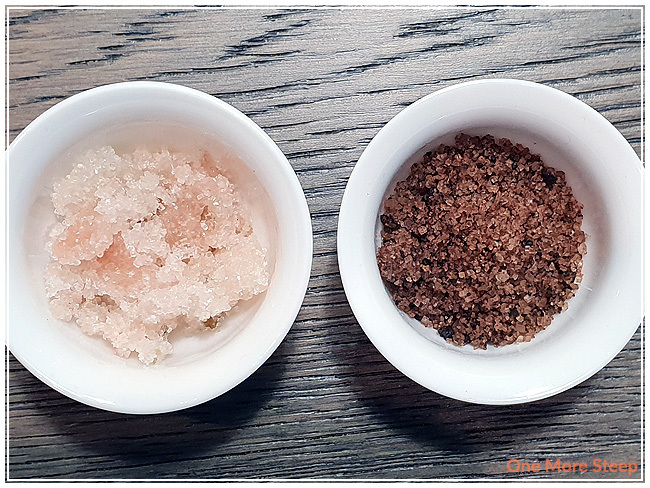 I received these two Sugar Scrubs from F&B Tea Co via The Sugared Tea Cup’s August box. They came in little zipped baggies with a label over the opening. I got two different flavours: Reinvented Chocolate and Cherry Rose. The labels have all the ingredients listed and the clear bags allow me to see the scrub itself. Reinvented Chocolate has a brown colouring to it, and it smells like chocolate. Cherry Rose is a light pink, I can smell the roses, but I don’t really smell the cherry. Reinvented Chocolate consists of: organic cane sugar, organic coconut oil, organic Darjeeling black tea, organic coconut butter, organic cocoa powder, orange blossom water, Oreo chocolate crumble, cinnamon sugar, bergamot essential oil, and vitamin E. Cherry Rose consists of: organic cane sugar, organic brown sugar, organic coconut oil, red rose green tea, rapsflower blossom honey, organic pure cherry juice, rose water, and vitamin E. Both labels on the sugar scrubs state that they are edible. There were no instructions on the sampler bags’ labels, nor were there instructions on the company’s Etsy product listings for usage. The product listings for the company’s Sugar Scrubs did boast a shelf life of 4 to 6 months. I tasted a small amount of each Sugar Scrub. I found Reinvented Chocolate to taste like chocolate and sugar – which I’m not surprised at given the ingredients in it. I don’t really smell Oreo cookies in it, but they probably add to the chocolate flavour of the scrub. Cherry Rose tasted sweet, with a hint of roses. It has a nice floral flavour to it. I did try both Sugar Scrubs in the intended manner. What I did was use a clean spoon to scoop some up and rubbed it into some rough dry spots on my hands, and then washed away with warm water. Now, the product listings do state to use the Sugar Scrubs daily for four consecutive days, and then as needed. I use them for two days (one day per flavour). 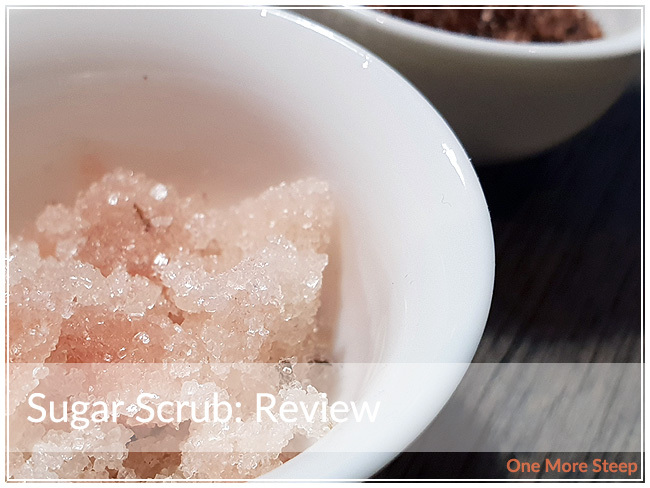 I found that the gritty texture of the Sugar Scrub did help remove some of the dead dry skin, although I’m not sure if the flavouring aspect of each scrub did anything for me. I liked F&B Tea Co’s Sugar Scrubs. I think I would be more likely to use these as a sugar alternative versus skin care product. The 20g bag is supposed to last 7 days, but I think that really does depend on how large of an area you’re trying to scrub. However, flavours are very similar to what the names are – Reinvented Chocolate especially. I think that Reinvented Chocolate would be a great addition to a black tea, while Cherry Rose would be great in either a flavoured green tea or a black tea. Both would be nice alternatives to plain sugar cubes for an afternoon tea.